Heat oven to 375°F. Heat baking sheet on bottom rack of oven. Meanwhile, place pie crust in 9- or 10-inch tart pan with removable bottom as directed on box for One-Crust Filled Pie. Press in bottom and up side of pan. Trim edge if necessary. In another medium bowl, beat cream cheese, 1/3 cup icing sugar, the vanilla and egg with electric mixer on medium speed until creamy. Spread over bottom of crust. Top evenly with apple mixture (apples will not cover top completely). Place tart pan on heated baking sheet on bottom rack in oven. Bake 30 to 35 minutes or until filling is set, apples are tender and crust is light golden brown. Cool on cooling rack about 30 minutes. Refrigerate at least 4 hours or overnight. Just before serving, in small bowl, mix 1/2 cup icing sugar and 1 teaspoon milk. Stir in additional milk, 1/2 teaspoon at a time, until thin enough to drizzle. 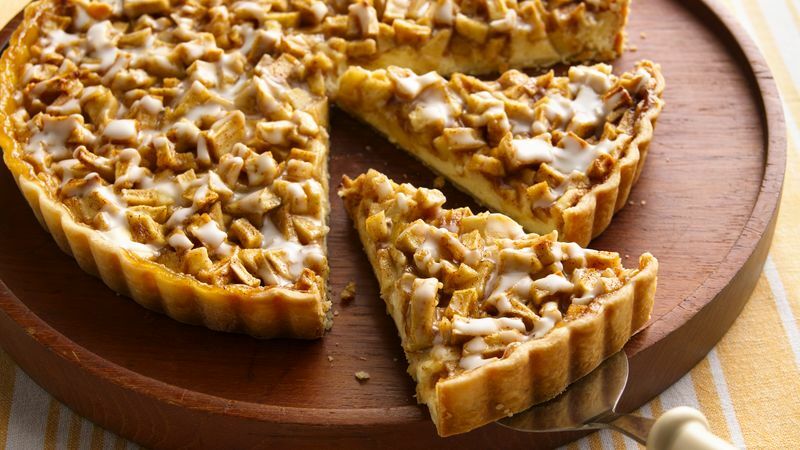 Drizzle glaze over tart. Remove side of pan; cut into wedges. Store covered in refrigerator. Most tart pans are shiny aluminum, which prevents the bottom of the crust from browning. Baking on a heated baking sheet helps the bottom crust to brown.